What differentiates a living breathing human body from a cadaver? After all, the hardware is still there: heart, lungs, brain – they are just not working. If you ask a medical professional, he’d say: electricity. If you ask a yogi, he’d say: prana. Is it the same thing? Yes and no. According to the yoga tradition, from the moment of conception it is prana that animates a human body, “breathes life into it”, so to speak. And not just people; all living creatures, plants, etc. When I throw away wilted kale from my refrigerator, my husband jokingly asks: “Had it lost its prana?” That is exactly what happens – once prana, the life force, is gone, the shelf life (ours or vegetable’s ) is over. If you never read Swami Vivekananda’s work on prana, I recommend it, it’s fascinating. He says that prana is the same in our bodies, other living creatures and the rest of the universe. So if you learn to harness and direct your own, you will be able to “move the sun and stars out of their places”. Let’s not rush into that; how about looking into ourselves first? How do we get access to prana in yoga? We do it through breath and attention. Breath is not the same thing as prana; breath is a vehicle for it. The motion of the lungs is the most obvious manifestation of prana in the body, and it’s also the one that we can consciously control (via controlling the respiratory musculature). 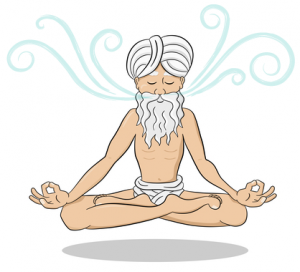 We tend to think of pranayama as breathing practices, but that’s not what it is. Prana means “life force”, ayāma means “expansion”. Pranayama is about expanding our life force, and breathing practices are means to make it happen. DIGESTION “The Jatharagni (gastric fire) is augmented. Appetite becomes keen. The excretions become scanty. When the flow of prana through the body is impeded, we get something that my teacher calls “a garden hose effect”. You know how if you kink your garden hose the water stops flowing? Same with prana. If you obstruct the prana flow in some way (“kink the hose”), all sorts of problems will result. By the way, the original purpose of yoga asanas was to be “prana pumps” – to move the energy to every nook and cranny in the body and nourish it. That’s why sometimes we talk about energy lines in yoga poses: often you can tell right away if the contours of the body form organic lines enabling smooth prana flow, or if the lines are “kinked”, restricting the energy flow. The most common “kinking” that we do involves the position of the head – why would anyone want to restrict prana flow to the brain? Theoretically, you form the energy lines by positioning your body a certain way in a yoga pose, and then you use your breath to move prana along those lines. Which brings us to our next point – attention. According to the yoga tradition, energy follows attention. So whenever you say “Breathe into your right big toe”, what you mean is “Bring your attention into your right big toe and breathe deep”. That’s why it is so important to stay present with what your doing in your yoga practice, rather then thinking about your dinner, kids or laundry. I believe it was Sri Krishnamacharya who said that the quality of attention you bring to your practice should be similar to the kind you use when you are getting a loose eyelash out of your eye. In other words: focus! Because of its essential nature, yogis had developed multiple ways of looking at different aspects of prana. Some of them might seem weird or way “out there”, but really it’s just a shift in perspective. For example, modern medicine tends to measure our health in numbers: cholesterol levels, blood pressure, forced expiratory volume, etc. To a yogi it would probably seem weird to think that someone’s number for total lung capacity would accurately describe how vital the person feels day-to-day. 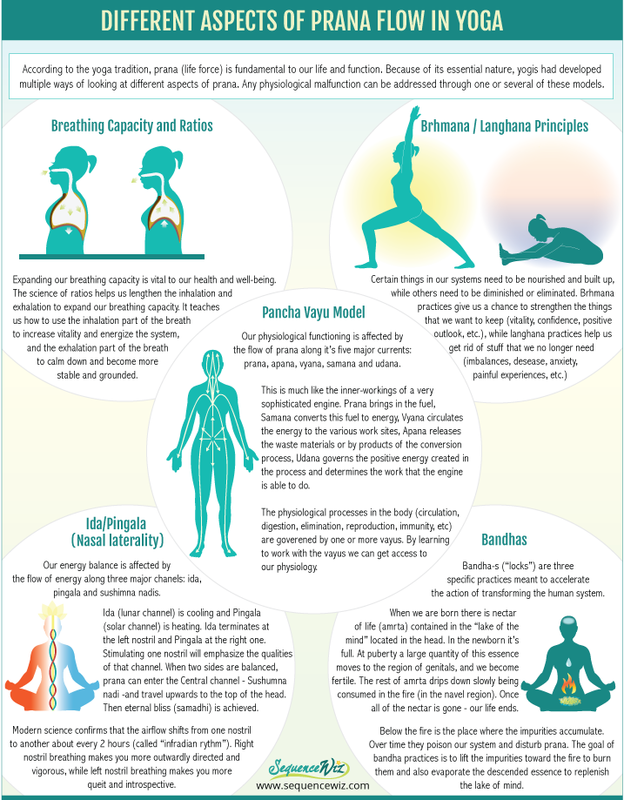 Here is a quick overview of different aspects of prana in yoga; we will discuss them in detail over the coming weeks. We often tend to feel helpless when it comes to our physiology; it seems like we don’t have any control over it. According to Swami Vivekananda “Every part of the body can be filled with prana, the vital force; and when you are able to do that, you can control the whole body. All the sickness and misery felt in the body will be perfectly controlled.” Apparently, the only reason we don’t have this power is because we don’t exercise it. We know that dogs can move their ears; we could, too, if we put enough time and effort into it. Swami Vivekananda says it works the same with prana. It’s OK if you don’t believe him. Give it an earnest try and find out for yourself. Let the journey begin! Log in to your Sequence Wiz account to get the Aspects of Prana Flow handoutGo to Forms/Handouts on your Sequence Wiz home screen and you will find a pdf file of the Aspects of Prana Flow handout. It’s yours to keep and/or give to your students. Hi Laura! I was taught that “ayāma” means to extend or expand. Here is a short discussion about it: http://en.wikipedia.org/wiki/Pranayama with relevant sources. Thank you for reading! Previous story Why bother with breath in yoga?